Robbie Burns stated in his poem "To a Mouse" something to the effect of "the best laid schemes of mice and men often go awry" and these words were very apt for our Sunday. This past week my husband was excited about an automobile Concours at the Trump National Golf course in Palos Verdes, California this weekend. He's a car enthusiast and while I normally tune out when the conversation turns to cars, any event called "The Age of Elegance" featuring Gatsbyesque Duesenbergs and Packards piques my interest. So as planed, we got up early, had breakfast and got dressed. My aim was to look like a dame who could afford a Duesenberg, even though my dress from Forever 21 literally cost $8. Just as we were about to leave, unforeseen circumstances forced us to cancel our plans, but I wasn't going to let my outfit go to waste, so here's a few pictures to highlight what I was planning to wear. I've been waiting forever to take my Prada car applique clutch to a car event such as this one. One of the things on my bucket list is to go to the Pebble Beach Concours so I can rub shoulders with the likes of Clint Eastwood and Ralph Lauren. On a side note, a few musings about my outfit: I grew up with the hard and fast rule of no white after Labor Day. Living in Southern California and feeling as though I'm still in the midst of a sweltering summer, I feel white is an acceptable choice. Plus, Clinton Kelly of What Not to Wear fame said it was okay and he is the ultimate authority on fashion, next to Tim Gunn in my book. I'm starting to really love clutches. They are not practical, but they are way more fun than just an ordinary handbag especially when they feature a car. I'm still trying to figure out how to hold them to look "elegant." Here's a few variations I tried. This bag is a bit more cumbersome than your average clutch which only adds to the dilemma. Thanks, all dressed up and nowhere to go I guess! I hope to make it sometime to Carmel as it is such a fantastic town! 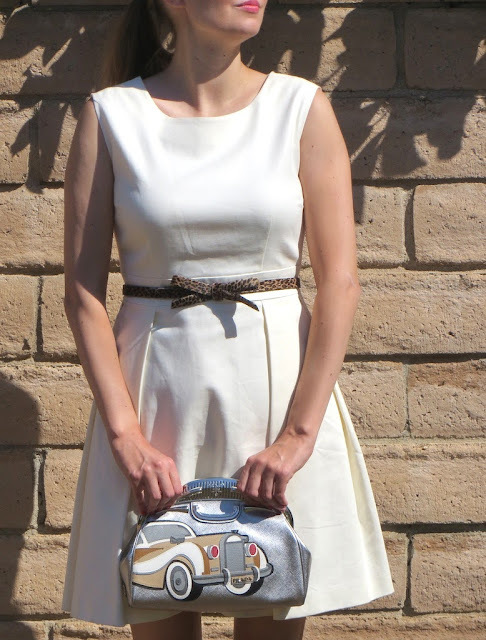 i love this dress on you - and the clutch is adorable. sorry your plans were cancelled! Thanks phiphi! No worries with the plans. I think it all worked out for the best as things often do.